It is said that the Tea Party movement started with a rant by Rick Santelli, CNBC correspondent, on the trading floor of the Chicago Mercantile Exchange on Feb. 19, 2009 but the truth is that it started long before that. 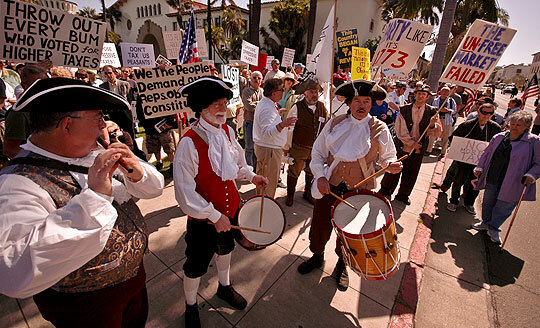 The Tea Party movement started over 200 years ago, on December 16, 1773, with a simple act of civil disobedience in rejection of a small tax on tea – “a 3 pence.” On that evening, approximately 100 “radicals” from Boston, members of a secret organization of American Patriots called the Sons of Liberty, dressed up as Mohawk Indians, boarded three East India Company ships, and dumped 342 chests of tea into the Boston Harbor. The Boston Tea Party would have as a direct consequence (albeit in 1775) the firing of the first shots of the Revolutionary War…. and then, our independence from a tyrannical government. Just as John Adams commented that the American Revolution was in the hearts and minds of the colonists even before a drop of blood was spilled at Lexington – “The Revolution was in the minds and hearts of the people; a change in their religious sentiments of their duties and obligations. This radical change in the principles, opinions, sentiments, and affections of the people, was the real American Revolution” – our current (tax and spend) revolution has been in the hearts and minds of ordinary hardworking folks even before Barack Obama took office. Conservative voters were already questioning why the government was bailing out banks (Bush signed a $700 billion plan to bail out banks), why billions of dollars of their hard-earned tax money was being spent on enlarging government programs, and why politicians were willingly saddling their children with government debt. On February 15, 2009, a young mother named Keli Carender, blogging under the name “Liberty Belle,” spread the word about a grass-roots protest she was organizing in Seattle to express outrage over the passage of the trillion-dollar Stimulus Bill (aka, “The American Recovery & Reinvestment Act”; aka, the “Porkulus” Bill; aka, the “Generational Theft Act of 2009”). She was enraged that such a bill passed Congress and especially without much discussion or opposition by Republicans. It was the first time she did any kind of political organizing. She was simply a conservative mother who blogged and never envisioned herself jumping into any political arena. Amazingly, she organized the event in a few days all on her own by reaching out on the Internet, contacting her local talk radio station, and talking to anyone who would listen. Also in February, local radio host Leland Conway in Kentucky called on his listeners to send pork rinds to liberal NY Senator Chuck Schumer. Conway’s idea was motivated by Schumer’s arrogant statement that only the “chattering classes” – the middle class – cared about the “teeny, tiny” pork amendments in the Generational Theft Act. In response to his radio plea, a mountain of 1,500 bags of pork rinds poured into the station and on February 16, they were shipped to Schumer. On February 18, 500 fed-up taxpayers showed up in Mesa, AZ to protest President Obama’s plans to expand the government’s mortgage entitlement program. (Think about what happened with Fannie Mae/Freddie Mac). On February 19, ordinary citizen Amanda Grosserode e-mailed that she was organizing a tax protest in Overland Park, KS the following weekend. More than 400 people showed up in freezing cold weather to protest Rep. Dennis Moore’s vote for the stimulus bill. And also on that same day, CNBC’s Rick Santelli issued his now-famous rant over Obama’s plans for mortgage entitlement and the need for a Chicago “Tea Party.” Santelli accused the Obama administration of “promoting bad behavior” and subsidizing mortgages to people who didn’t deserve them in the first place. After all, there is no RIGHT in this country to own a home. But Democrats are in the business of finding new rights and new entitlements. administration? Why don’t you put up a website to have people vote on the Internet as a referendum to see if we really want to subsidize the losers’ mortgages; or would we like to at least buy cars and buy houses in foreclosure and give them to people that might have a chance to actually prosper down the road, and reward people that could carry the water instead of drink the water? This is America! How many of you people want to pay for your neighbor’s mortgage that has an extra bathroom and can’t pay their bills? Raise your hand. RANDOM TRADER: How ’bout we all stop paying our mortgage? SANTELLI: You know, Cuba used to have mansions and a relatively decent economy. They moved from the individual to the collective. Now, they’re driving ’54 Chevys, which is probably the last great car to come out of Detroit. SANTELLI: You could go down to -2%. And they can’t afford the house. JOE KERNEN: So why are they in the house? Why are we trying to keep them in the house? SANTELLI: We’re thinking of having a Chicago Tea Party in July. All you capitalists that want to show up to Lake Michigan, I’m gonna start organizing. WILBUR ROSS: Rick, I congratulate you on your new incarnation as a revolutionary leader. SANTELLI: Somebody needs one. I’ll tell you what, if you read our Founding Fathers, people like Benjamin Franklin and Jefferson,… What we’re doing in this country now is making them roll over in their graves. For too long, Americans have not been watching. Washington, Chicago and other cities across the US. The Tea Party movement and Tea Party phenomenon had been born. “We are American Patriots, defenders of First Principles and Essential Liberty. We are Soldiers, Sailors, Airmen, Marines, Coast Guardsmen and public servants standing in harm’s way at home and around the world, who are loyal, first and foremost, to our revered oath to “support and defend” our Constitution. We are mothers, fathers and other family members nurturing the next generation of young Patriots. We are farmers, craftsmen, tradesmen and industrial producers. We are small business owners, service providers and professionals in medicine and law. We are employees and employers. We are in ministry at home and missionaries abroad. We are students and professors at colleges and universities – often standing alone in such institutions for what is good and right. We are Patriot sons and daughters from all walks of life, heirs to the blessings of Liberty bequeathed to us at great personal cost by our Patriot forebearers, confirmed in the opinion that it is our duty to God and Country to extend that blessing to our posterity, and avowed upon our sacred honor to that end. We are vigilant, strong, prepared and faithful. The Tea Party is not a political party. It is not organized around a national platform and handed down for its members to follow. Rather, it’s a bottoms-up, grassroots organization dictated by the concerns of taxpayers and other patriots who hold certain principles as non-negotiable. And the Tea Party is definitely here to stay. Alot of the good folks are from the middle class. We the People don’t forget when we are insulted by the upper crust. Straight from the mouth of Old Timer Rino McCain “go back to middle Earth”. We simple Middle Earth People should not question decisions made in Washington. I say this, the only way to influence a decision is to question it! When a decision maker can not answer questions to a reasonable degree they should be identified as such.